Home Office data from 2018 showed a noticeable increase in hate crimes recorded by the police across all monitored strands. This is supported both by evidence submitted to the APPG on Hate Crime enquiry itself as well as a literature review. Government statistics and reports released in 2017 and 2018 also support this statement. Although the rise can be partly attributed to greater levels of reporting by victims and witnesses, under-reporting still plagues this area of criminal justice so better reporting and recording in no way fully accounts for the increases seen. Hate crime predominantly takes the form of verbal abuse or harassment, although this can vary within strands (e.g. lesbian, gay, bisexual and trans [LGBT] victims tend to be the victims of physical assault and individuals with learning disabilities often fall victim to financial or sexual exploitation). 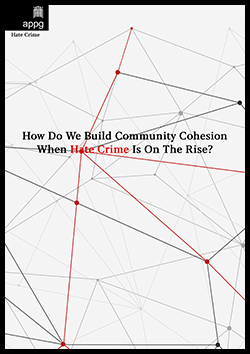 In many targeted communities, hate crime remains massively under-reported, in part due to the normalization of it, i.e. victims experience hate crime and hate speech so frequently it has become ‘part of life’ to them. There can also be issues around trust when it comes to dealing with the police themselves (e.g. Traveller communities rarely engage with the police due to a fear of further victimization). Hate crime is often intersectional in nature (e.g. many victims are women as well as being black, LGBT, Muslim etc.). However, the current legislation does not allow for this intersectionality to be recorded so the picture that authorities have lacks depth and subtlety. Hate crime has a markedly greater impact on the emotional and mental well-being of victims when compared to non-hate motivated offences. It leads to more behavioral changes in victims (e.g. not going out of the house as often, changing their routes to and from work etc. to avoid harassment). There is evidence that links being the victim of hate crime to serious mental health issues including suicidal ideation and suicide itself. Children and young people are particularly vulnerable to hate crime, both through absorbing harmful online content as well as being exposed to the prejudices of adults in their day to day lives. which can have lasting impacts on their lives. Targeted individuals do not always have faith that teachers at their schools will be able or willing to support them properly. The online world is a fertile breeding ground for hate crimes and hate speech, and what occurs in the digital realm can spill over into the physical world with serious consequences (e.g. the murder of Jo Cox MP in June 2016). Many submissions to the enquiry said that the government should take urgent steps to implement the recommendations of the Law Commission report published in 2014. During the production of this report it was announced that a full review of all hate crime legislation would be carried out by the Law Commission. This review will have a wide-ranging remit covering all aspects of current hate crime legislation as well as considering if any new characteristics should be protected. The APPG on Hate Crime welcomes the recent governmental decision to order a full review of hate crime legislation by the Law Commission and hopes to play a role in this process. There was a clear desire to see a more consistent approach towards hate crime from police forces across the country. There was a stated need for more training in awareness and how to approach victims, as well as for police forces to reach out to the marginalized and targeted communities in their regions. National government has a key role to play according to submissions received. It was largely agreed that current hate crime legislation is fragmented and creates a ‘hierarchy of hate’ that needs to be addressed (e.g. racism and religious hate crime can carry a greater penalty than LGBT or disability related hate crimes). It remains to be seen what recommendations come from the Law Commission review but there are clear arguments for expanding the categories of hate crime and for updating and consolidating the existing legislation to make it more consistent and straightforward in its application. One area where charities and community organisations can make a valuable contribution to the fight against hate crime is through supporting the provision of restorative justice. Research has shown that use of a restorative approach can bring tangible benefits to all parties and reduce the risk of future offending by perpetrators.